I'm using an Arduino Uno and Ethernet shield with the WIZnet chip W5100. The WebServer code example is working. DHCP is working, the Ethernet shield is receiving an IP address from the Linksys modem "router" and everything is fine. But I cannot connect to a web site using the WebClient code. I found out that client.connect(server, 80); is returning -1 "Time_OUT" and it is supposed to return 1 according to the Arduino Ethernet library. I tried connecting to different websites. I tried assigning an IP address manually, not using DHCP. I tried making pin 4 of the SD memory card SPI to output pinMode(4, OUTPUT); digitalWrite(4, HIGH); But it doesn't work. I get on my Serial line connection failed or it returns "connected" then "Disconnecting..." immediately after because client.connect has returned -1. Using a local server IP address like my router's IP address, the connection works. But the issue is mainly in the WAN. Any help would be appreciated. If the first call to client.connect() succeeds, you call it again immediately, and the error message you're seeing comes from that second call. This really is not surprising — I can't imagine a scenario in which that would actually work. The problem was in the mac address itself. When i used the mac address given by the example itself the connection didn't fail and client.connect() returned 1. 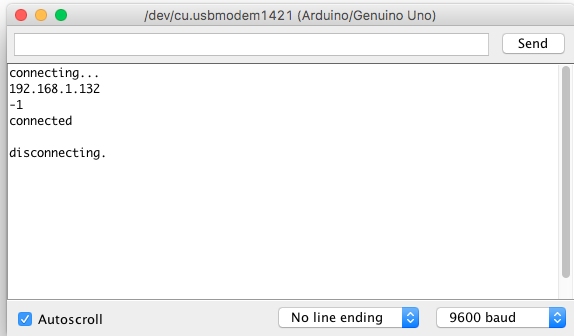 DF Robot W5200 Ethernet Shield for an Arduino Uno not working?